Texas A&M officials were attracted by Young’s national reputation and his track record while leading the University of Utah and later the UW. In particular, Sharp praised Young’s success at broadening research and commercialization ventures — taking ideas and discoveries and turning them into marketable products. At the UW, Young’s efforts helped launch a record number of start-up companies, and he pushed UW to become a national leader in licensing technology. "Deciding to be a candidate for the presidency of Texas A&M University was one of the hardest decisions I’ve ever had to make. "I was not looking to leave the University of Washington, but the allure of the recruitment process led to conversations in which the opportunity to bring new leadership and fresh ideas to another outstanding university presented itself with some force. "My time at the University of Washington without question has been the most rewarding of my professional career to date. The University is one of America’s great universities, and I’m proud of what we’ve accomplished here. There are many exciting initiatives in motion and much to look forward to. I believe my successor will have ample opportunity to build on what the outstanding leadership, faculty, staff and students at the University have under way — and of course develop new initiatives of his or her own. In the latest example of an “arms race” in public university leadership, Michael K. Young will earn at least $1.4 million a year, plus an $800,000 signing bonus, as president of Texas A&M University’s flagship campus. Young, who will take office May 1, 2015, will be the highest-paid public university president in Texas and one of the highest-paid in the nation. In addition to his $1 million base salary, he’ll get a $200,000 annual housing allowance and $200,000 annually in deferred compensation. He’s also eligible for up to four $100,000 bonuses for meeting performance measures. A&M is the latest Texas university to lay out big money to lure a leader from another university or to keep a president from being stolen away. Young will come to College Station from Seattle, where he spent three years leading the University of Washington. In October, Young received a 6.2 percent pay bump at the University of Washington, bringing his salary to $622,008, plus deferred compensation of $193,500, a $12,000 per year car allowance and a retirement plan contribution of $26,000. Last month, when Young was named the finalist for the presidency, A&M System Chancellor John Sharp said Young would be one of the top-paid leaders in the state. “He probably won’t make what an assistant football coach makes, but he’ll be paid darn well,” Sharp said at the time. Bill Powers, the outgoing president of A&M’s longtime rival, the University of Texas at Austin, made a base salary of $624,350 and receives an annual $50,000 in deferred compensation, the school said Tuesday. A&M also is covering Young’s moving expenses to College Station and “reasonable expenses incurred in moving himself, his spouse and their personal property to their next residence away from the College Station.” Young will receive up to $15,000 in supplemental life insurance annually, providing a death benefit of $5 million. More colleges, typically top-tier research schools like A&M, are crossing the million-dollar mark in presidential pay, said Sara Hebel, assistant managing editor at the Chronicle of Higher Education, which puts together an annual list of executive compensation at public universities. The latest list, which used information from the 2013 fiscal year, found nine schools paying presidents more than $1 million in total compensation. That was up from four schools in 2012 and three in 2011. The first million-dollar payment wasn’t recorded until 2006, Hebel said. Young’s $1 million base salary is higher than the $851,303 former Ohio State University President E. Gordon Gee earned as base pay. Gee was the highest paid public school president in the country in 2013. “The million-dollar college president was unheard of a decade ago, but it’s becoming increasingly common at top-tier institutions,” Hebel said. It has also become increasingly common for presidents to get perks like a car, country club membership or housing allowance, Vedder said. But Young’s $200,000 yearly housing allowance is unheard of, he said. Young will be A&M’s first president not to live in the sprawling, two-story colonial president’s home on campus since before Gen. Earl Rudder, who became president in 1959. Sharp has said the home will be used for hosting dignitaries, former students and donors and to host receptions. 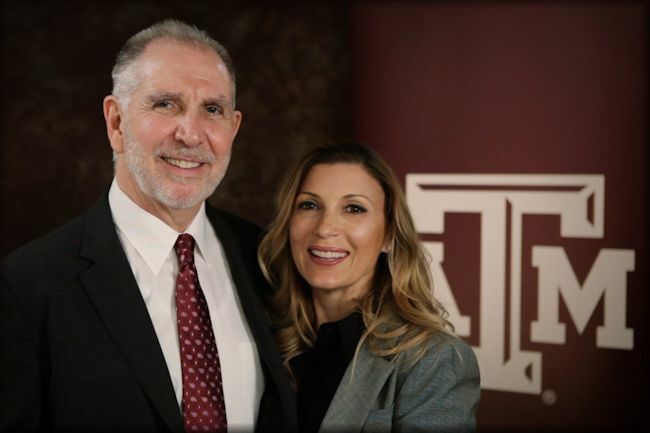 “What we discovered is that sharing that house with former students, the Aggie nation, could result in a lot of goodwill and a lot of fundraising and things like that that were far more valuable than having somebody live there,” Sharp said last month. Young’s $200,000 allowance can get him far in College Station, where the median home price was $189,000 in 2015.